Last week I had the amazing honor to view Disney Pixar’s Coco movie on the Day of the Dead. Here’s my (no spilers!) review of the Coco movie- and a free color printable activity sheet featuring all your favorite Coco characters! After watching countless previews for the Coco movie, interviewing the Director of Photography Danielle Feinberg, and obsessively looking at Coco merchandise on Amazon (affiliate), and creating all kinds of fun projects at home related to the movie, I finally got to see the film- and it was incredible. Latino culture and traditions are so close to my heart- first I started as a high school Spanish teacher for 15 years before staying home to raise bilingual daughters, then traveling to Costa Rica each year so our girls can be rooted in both their cultures, to now cooking traditional Latin cuisine every day in our home, I am very protective of Latino culture. I didn’t realize until about halfway through the Coco movie that I was watching it with bated breath- would Pixar honor our culture in a real and authentic way, or would they gloss over our values in order to make a box office blockbuster? The use of language- the dialogue in the movie uses tons of English and Spanish. The way the characters switch back and forth between lauganges was so authentic to the way bilingual people speak to each other- and there were so many funny bilingual jokes that I cherished. The use of color- Mexico is awash with bright, beautiful colors at every turn- and the movie is too. Amazing! The music- there are three types of Mexican music in the film, and even the score is delightful. The art- Frida Kahlo makes an appearance in the film, and it is AMAZING. I laughed to hard when she yelled “fire!”- that’s all I will say. Family values- Coco is not a traditional boy meets girl love story. Hooray! Instead it features a univeral truth about the power of familial love across time and distance. There wasn’t a dry eye in the theater when the final credits started rolling. I highly recommend the movie to anyone 6 and over- and under that age with a caution. I won’t have my kids see it until they are older- both my girls are highly sensitive to displays of emotion on screen, and death is a topic that we haven’t really broached. There is also a spirit animal that is pretty intense- and I know it would be scary for my 2.5 year old. 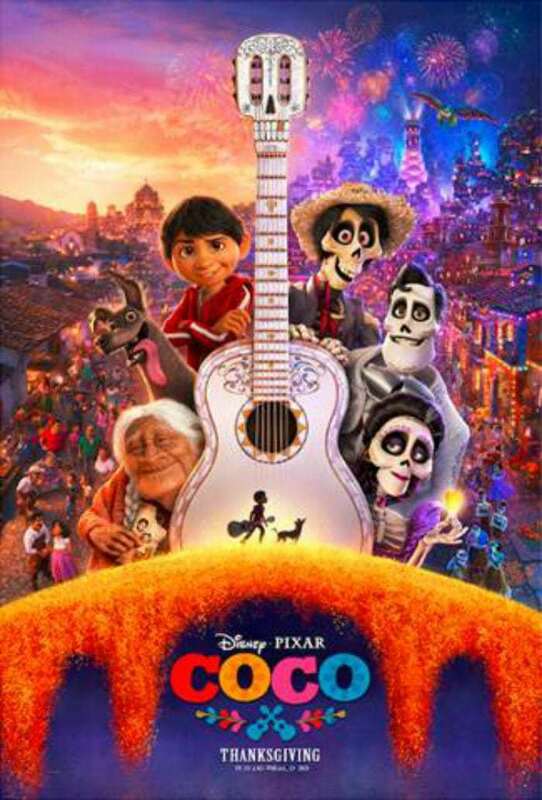 This movie will be a great celebration of culture for them when they are older- but for now we will be rocking the soundtrack and some of the movie clips as an introduction to the idea of Dia de los muertos (which we don’t actually celebrate in Costa Rica). There were definitely kids as young as 3 in the audience, and they enjoyed the film which I think is awesome. Each family has to decide what is right for their kids- either way, death is a central part of the film and needs to be addressed in conversations surrounding the movie. Also- there has been some push back from the Latino community about the movie not being released on Day of the Dead, and waiting until Thanksgiving. The central value of the movie is family- and in the Inited States, Thanksgiving is a very important family holiday. While Pixar did release the movie before Día de los muertos in Mexico, they chose to wait in the States to release it with a family holiday. I think it’s a great move. So- go see the movie and let me know what you think! And don’t forget to print out this fun activity sheet to prep for your theater trip! Just click on the link below to print.